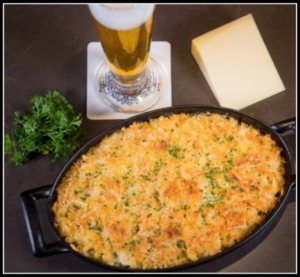 Image of Lager Lobster Macaroni and Cheese taken for the Beer Institute. Recipe was created by Chef Laurent Aubel. Over high-heat, bring a large pot filled with water and a pinch of salt to a boil. When boiling, add dry pasta and cook approximately 8 minutes or until al dente. Drain pasta and drizzle with a little olive oil to keep it from stick, set aside. Over high-heat, bring a large pot of water, lemon, and Old Bay to a boil. Add the lobsters head first into the pot and cover. Return water to a low-boil and steam lobsters for approximately 7 minutes per pound. Lobsters will be bright red when done. Remove lobsters and put them in ice water. Remove the meat and cut into bit sized pieces. If possible, save a couple of the larger pieces of lobster shell. In a saucepan over medium heat, add olive oil, shallots, garlic, thyme, and lobster shells, cooking for 3-5 minutes. Add lager beer and let reduce for 3-5 minutes and then add cream. Simmer over medium-heat for 20 minutes. Strain mixture (removing lobster shells) and transfer to a sauce pan adding gruyere and cheddar, combine until smooth (additional heat may be required). Season cheese sauce with salt and pepper to taste. Add lobster and macaroni until combined. In a 9-inch x 13-inch pan, add macaroni mixture. Sprinkle with panko crumbs and bake in the oven for 15-20 minutes or until the top is golden brown. Just before serving, sprinkle the fresh chopped parsley.